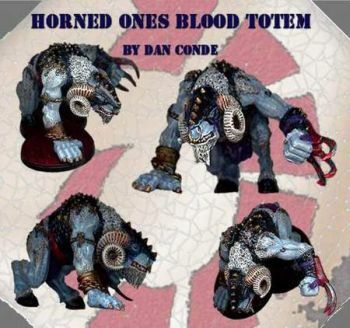 The Blood Totem of the Horned Ones is a powerful creature that knows no fear and offers no quarter. 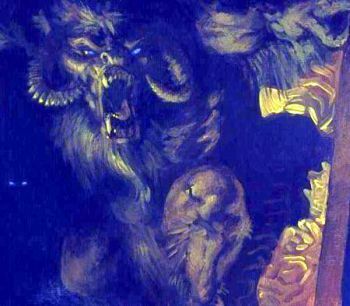 Enemies that meet its thunderous charge are trampled mercilessly if they survive the impact of its ramming attack. When the Horned Ones marshal for war, their Blood Totems are seen towering over their forces, a misting breath escaping in measured bursts from their great nostrils. This Blood Totem is a furious fighter and possesses the greatest rage towards the Devout, which send it into fits of red haze should it encounter them. In honor of their fallen kin, the Blood Totem is often decorated with the skulls of the hated Elves who were responsible for the Dragon Clans Fall.